Several inches of snow fell overnight making roads slick and closing area schools. The forecast called from additional snow turning to cold rain later in the afternoon. Most of us signed up for the Winter Silhouettes field trip probably thought it would be postponed for a second time, but Roxanna was working the phones early in the morning to determine who and how many would show up in spite of the weather. 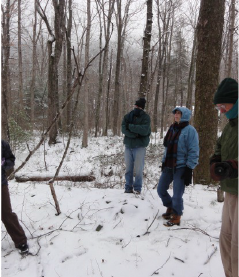 At 11:00 AM a hearty band gathered at the U.S. Forest Service Work Center at Buffalo Gap – RoxAnna, Gretchen, Dwayne, Pat, Judi, Kathy, Carl, and Tom – to meet up with state forester Patti Nylander for a primer on tree identification during the leafless winter months. Patti pointed out various characteristics such as size/shape of the tree, bark form and coloration, branch alignment, and even smell to help identify trees commonly found in Shenandoah Valley woodlands. Some like the shagbark hickory (pictured), white oak, and evergreens such as hemlock are easy to identify. It can be more difficult to distinguish between others, for example the scarlet and black oaks. Most of us will probably identify trees during warmer months when leaves, flowers, nuts and other distinguishing characteristics make using the field guide much easier. Patti’s tips on identifying trees during the winter months strengthened this group of Master Naturalists’s year-around tree identification skills. October 23, 2013 in Field Trips.